Here is a card I made for a stamp class I had a few weeks a go. The class was ways to use vellum and I really like how this card turned out! Here is how to make it. 1. Stamp the dog on watercolor paper with VersaMark and emboss with alexandrite powder (Stampendous). Color using Twinkling H2O's, layer onto dark blue paper. 2. 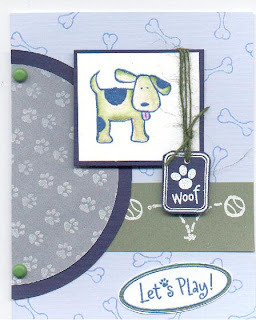 Stamp the "woof" tag onto dark blue paper, cut out and tie to dog panel with green jute. Set aside. 3. Stamp olive strip the bouncing ball with VersaMark ink and emboss with white powder. Glue to a light blue card that has been randomly stamped with a dog bone. 4. To cut the half circles, use a circle coluzzle and cut a half circle out of dark blue paper using the largest circle. Do the same with the vellum but use one size smaller circle. 5. Stamp the vellum half circle with white Brilliance using the foot print stamp from the set. Then layer it onto the blue circle and attach with green brads. Glue to the card. 6. Mount the dog image to the card using foam squares. 7. Stamp let's play on watercolor paper with VersaMark ink and emboss with alexandrite powder, cut out and glue to card as shown. Well I'm off to take my daughter to waterpolo, then later today my son goes to Tae Kwon Do and I will make dinner sometime inbetween. Hope everything above makes sense, I don't have time to proof read! Have a great day. Jamie this is such a cute card... Your work is amazing!! Jamie, this is adorable!! I love the way you used the vellum-it's the perfect accent!! I still have lots of vellums that's about five years old-I need to use it!! cute card! I love the sketch and the little tag that says "woof!" Super cute! So cute!!!! I love the detail of the tag! I absolutely love your entire blog! This card is so cute! I love this card! Is so appropriate for a child! Thanks for stopping by my blog. You do wonderful work! :) Love how you give instructions....you're a queen with the embossing powder! Adorable card, Jamie. 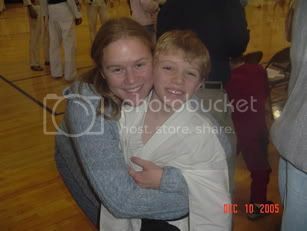 Love you little tag and the way that you attached it. I bet your class loved it too! Great job. Love the extra tag !! Oh Jamie - this is too stinkin' cute! Where did you get this adorable dog image? He's just too sweet!!! The tag hanging is the perfect touch. very cute card! Thanks for the tips too!